There are many companies who supply and fit replacement windows and doors manufactured from uPVC and other materials rather than traditional timber. Regrettably, many of these are of relatively poor quality, especially in terms of their appearance and feel, they are far removed from wood products. Although the majority are perfectly suitable, they look nothing like the originals and are likely to adversely affect the value of your property. In addition, poorly manufactured or fitted replacements may have problems with sealing or glazing and may warp over time, resulting in consequent heat loss and moisture ingress, hastening their decline and need for replacement again. At New Leaf Windows and Doors, we have been working with a number of suppliers who develop and perfect timber alternatives and are constantly on the look out for new products of a suitably high standard. We are now able to offer a wide range of timber-alternative windows and doors that are of simply astounding quality compared with other units. With the look and feel of original timber, and constructed to the highest possible standards, these replacement windows and doors are an ideal, long-term solution that is effectively maintenance free. Many of our products incorporate the very latest technical innovations. New to the UK market, seamless welding avoids the problem of having wide, visible joints in the corners of non-timber windows, and offers alternatives that really are as close to original timber as you will find. With regard to entrance doors, double-rebated units provide an external seal of both sides of the frame, resulting in superior weather resistance and thermal insulation. 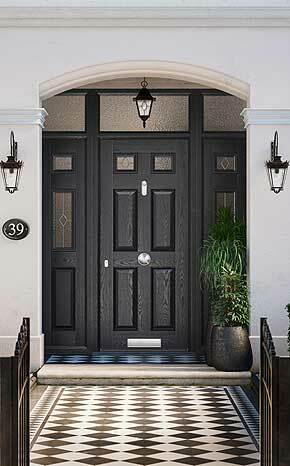 We also now offer an online 'custom design your own door' online service. Based on extremely high quality composite doors produced by Door-Stop, this system allows you to customise a replacement front or entrance door to perfectly suit your home and your taste, and to match existing windows and doors. We now also supply and fit a superb range of high quality, timber-alternative internal secondary glazing units. Ideal for situations where replacement of windows and doors is undesirable or uneconomic, this solution is also ideal for listed buildings and work in conservation areas. The external appearance is retained, whilst offering dramatic improvements to energy use and noise reduction. Please contact us for an appointment to visit our showroom or for any queries or questions you might have regarding replacement windows and doors. We supply and fit in Desborough, Kettering, Rothwell and all of Northamptonshire, and for larger installations are happy to travel further. We guarantee you will be amazed at the appearance and quality of our products; and you will also be pleasantly surprised at their cost! We have always believed in supplying and fitting only the highest-quality products with suitable warranties, and these timber alternatives provide exactly that. Please call us on 01536 601292 or 07720 626165, fill in our contact form, or click here to email us for further information.